There are many remedies that are usually recommended to naturally shrink fibroids and one of the popular ones is ginger. We previously discussed how crucial turmeric is for fibroids here and ginger is from the same family as turmeric so of course it has properties that can heal uterine fibroids naturally. The healing properties of ginger is why it is a common feature of Ayurvedic medicine as well as traditional Chinese medicine. Besides its use for natural healing, it is also a common feature of many culinary dishes in those areas. Prevention of nausea caused by seasickness and other types of motion sickness. It can also help with morning sickness from pregnancy. Ginger can help to reduce cholesterol levels, lower blood pressure and prevent blood clots and doing this is these three areas helps to prevent heart disease and stroke. Ginger is perfect for fighting colds and flu by being able to kill the influenza virus. Ginger has also been used to help relieve the symptoms of arthritis. Ulcer symptoms can be treated with ginger although it does not cure ulcers. Ginger can help with various digestive problems. Ginger can help with various women’s health issues including helping to ease menstrual cramps by soothing the uterus. Its abilities for helping ease various women’s health issues is why it is beneficial for women suffering from uterine fibroids and why it can help naturally shrink fibroids. The development of fibroids is commonly blamed on an estrogen dominant state although these tumors can develop due to other reasons but hormone imbalance is one of the key triggers. Ginger has a stimulating effect on the endocrine glands which are important for ensuring hormonal balance. Hormonal balance deprives fibroids of the excessive estrogen they need to thrive and this can help to naturally shrink fibroids. In addition, ginger has anti-inflammatory properties as well as being able to stop “bad” prostagladins which can help reduce menstrual cramps that are associated with fibroid tumors. There are many ways to consume ginger for fibroids and the fresh root is the best kind of ginger to use. If you do not have access to fresh ginger, capsules and tinctures can work. If you have fresh gingerroot, you can grate it and use it as a condiment. Ginger tea for fibroids is another way to use gingerroot. It is also a great replacement for coffee. Start by using 2 to 4 grams a day and make changes to suit your needs for relief from fibroids and the symptoms of fibroids. Ginger is generally considered a safe herb by the FDA but you do need to be aware of the following. In addition to the many health benefits of ginger discussed above, it has also been used to promote menstruation. If you have a problem of heavy bleeding due to fibroids, you may want to avoid taking ginger but do keep in mind that Chinese physicians usually recommended 20 to 28 grams of ginger to promote menstruation and the recommended amount for fibroid healing is nothing close to this. So you may be okay if your daily consumption does not reach these high levels. If you are pregnant, you may want to talk to your doctor first before taking ginger for morning sickness and only take modest amounts. Some people who take ginger to combat motion sickness have reported experiencing heartburn. If you suffer from hot flushes, you should avoid ginger because it heats the body. 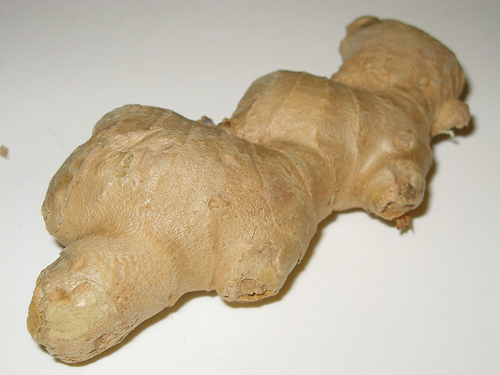 If you are about to undergo surgery, avoid ginger as it can interfere with blood clotting. But all in all using ginger for uterine fibroids is one of the best ways to naturally shrink fibroids as long as you use modest amounts. Fresh ginger is commonly available everywhere and you can grow your own. Ginger capsules also work and are very convenient. For more on the most effective ways to naturally shrink fibroids and prevent them from returning and disrupting your life, you need to click here for an awesome holistic fibroid treatment guide. Prev Do Uterine Fibroids Cause Pain?